Although definitions are easy enough to research and repeat, it is important that students learn to cast these concepts into their own words. Asking students to give practical examples of "circuits" and "non-circuits" is one way to ensure deeper investigation of the concepts than mere term memorization. The word "circuit," in vernacular usage, often refers to anything electrical. Of course, this is not true in the technical sense of the term. Students will come to realize that many terms they learn and use in an electricity or electronics course are actually mis-used in common speech. The word ßhort" is another example: technically it refers to a specific type of circuit fault. Commonly, though, people use it to refer to any type of electrical problem. This question gives students a good opportunity to discuss the basic concept of a circuit. It is very easy to build, safe, and should be assembled by each student individually in class. Also, emphasize how simple circuits like this may be assembled at home as part of the "research" portion of the worksheet. To research answers for worksheet questions does not necessarily mean the information has to come from a book! Encourage experimentation when the conditions are known to be safe. Draw an electrical schematic diagram of a circuit where a battery provides electrical energy to a light bulb. Other orientations of the components within the diagram are permissible. What matters, though, is for there to be a single, continuous path for electric current from the battery, to the light bulb, and back to the other terminal of the battery. Impress upon the students the importance of learning to "communicate" in the language of schematic diagrams. The symbols and conventions learned here are international, and not limited to use in the United States. How could a battery, a light bulb, and some lengths of metal wire be used as a conductivity tester, to test the ability of different objects to conduct electricity? Not only is this question an opportunity to solve a problem, but it lends itself well to simple and safe experimentation. Encourage students to build their own conductivity testers and test various substances with them. Suppose we had a long length of electrical cable (flexible tubing containing multiple wires) that we suspected had some broken wires in it. Design a simple testing circuit that could be used to check each of the cable's wires individually. A significant portion of electrical/electronic circuit problems are caused by nothing more complex than broken wire connections, or faults along the length of wires. Testing cables for wire breaks is a very practical exercise. 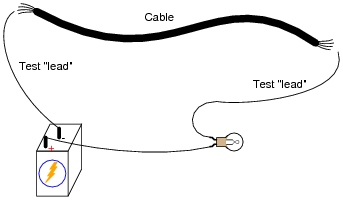 The same technique may be used to "map" wires from one end of a cable to the other, in the event that the wires are not color-coded or otherwise made identifiable. What do the symbols with the question marks next to them refer to? In the circuit shown, would the light bulb be energized? These are ground symbols, and they can either refer to connections made to a common conductor (such as the metal chassis of an automobile or circuit enclosure), or the actual earth (usually via metal rods driven into the dirt). Ask the students about the relative conductivities of metal chassis versus dirt (earth ground). Is a current pathway formed by two metal chassis grounds equivalent to a current pathway formed by two earth grounds? Why or why not? What conditions may affect these relative conductivities? Why would anyone use two wires to conduct electricity from a power plant to a house, as shown, when they could simply use one wire and a pair of ground connections, like this? This is not a practical solution, even though it would only require half the number of wires to distribute electrical power from the power plant to each house! The reason this is not practical is because the earth (dirt) is not a good enough conductor of electricity. Wires made of metal conduct electricity far more efficiently, which results in more electrical power delivered to the end user. Discuss the fact that although the earth (dirt) is a poor conductor of electricity, it may still be able to conduct levels of current lethal to the human body! The amount of current necessary to light up a household light bulb is typically far in excess of values lethal for the human body. What, exactly, is a short circuit? What does it mean if a circuit becomes shorted? How does this differ from an open circuit? A short circuit is a circuit having very little resistance, permitting large amounts of current. If a circuit becomes shorted, it means that a path for current formerly possessing substantial resistance has been bypassed by a path having negligible (almost zero) resistance. Conversely, an open circuit is one where there is a break preventing any current from going through at all. Discuss with your students some of the potential hazards of short circuits. It will then be apparent why a ßhort circuit" is a bad thing. Ask students if they can think of any realistic circumstance that could lead to a short-circuit developing. I have noticed over several years of teaching electronics that the terms ßhort" or ßhort-circuit" are often used by new students as generic labels for any type of circuit fault, rather than the specific condition just described. This is a habit that must be corrected, if students are to communicate intelligently with others in the profession. To say that a component ïs shorted" means a very definite thing: it is not a generic term for any type of circuit fault. In real life, of course, short circuits are usually things to be avoided. Discuss with your students why short circuits are generally undesirable, and what role wire insulation plays in preventing them. In case students have not learned battery symbol convention yet, please point out to them the "+" and "-" polarity marks, and note which side of the battery is which. One analogy to use for the switch's function that makes sense with the schematic is a drawbridge: when the bridge is down (closed), cars may cross; when the bridge is up (open), cars cannot. Between A and B: voltage or no voltage? Between B and C: voltage or no voltage? Between C and D: voltage or no voltage? Between D and A: voltage or no voltage? Between A and C: voltage or no voltage? Between D and B: voltage or no voltage? Based on these voltage determinations, what general statement(s) can you make about the presence or absence of voltage in a functioning circuit? Measuring between two terminals of a voltage source, or between two terminals of an energized load (a component having substantial resistance, with current going through it), there will be a voltage. Measuring between two points that are electrically common to each other, there will be no voltage (or at least an insignificant amount of voltage). Electrically common points are defined as points within a circuit that are connected together by conductors of negligible resistance. The concept of ëlectrically common" points is one that I have found very helpful in the analysis of circuits, because there are a some simple rules regarding voltage that relate to whether or not points in a circuit are "common" to each other.